Gran Canaria’s capital city, Las Palmas de Gran Canaria, is this year adding three new hybrid electric buses to its public transport fleet. This innovative project has been developed thanks to the support of the CIVITAS DESTINATIONS project – involving the CPMR – a four-year sustainable mobility project co-financed by H2020. The three hybrid vehicles will form part of a substantial investment from Las Palmas’s public transport authority (Guaguas Municipales) in the Las Palmas public transport system: a total of 25 buses will be joining the fleet in 2018. As the buses’ electric battery is recharged by driving, there is no need for them to go to charging stations. In addition, the bus model also has the potential to be fully electrified in the future, further decreasing its environmental impact. The vehicles will be 12 metres long and will each hold 91 passengers, as well as being fully adapted for use by people with reduced mobility. 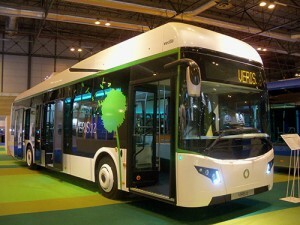 The cost of each bus is 325,000 Euros. Guaguas Municipales is receiving financial support from CIVITAS DESTINATIONS project to help with the purchase of the three hybrid buses as part of the project’s sustainable mobility measures. It involves cities in six European touristic islands from CPMR member regions and aims to develop innovative new initiatives promoting sustainable transport solutions for citizens and tourists alike without damaging the environment. The buses are one of a number of measures in a wider drive to make transport in and around Las Palmas de Gran Canaria clean and sustainable. A public bike sharing system has recently been introduced, whilst significant investment in cycling infrastructure is planned across the whole island of Gran Canaria.